At the end of each calendar year, a few analytics companies create a year-end review of the online music industry. Segments like streams, video views, album sales, and downloads are tracked and broken down by artist, genre, and release dates to give a comprehensive review of how America consumed music. The following is a breakdown of the report written by BuzzAngle Music released last week. The 84-page, in-depth report is regarded as the standard by which the American music industry dictates year-end numbers. Since streaming now dominates how people listen to music, I’ll focus exclusively on the streaming numbers and ignore sales, as the purchasing of individual albums and singles continue to plummet in the modern streaming age. As we comb through the information from this year, one thing remains clear: music has never been more popular than it is right now. Total on-demand streams increased by a staggering 35% in 2018. This year saw 809.5 billion total streams of audio and video music content, with 534.6 billion coming from audio and 274.9 billion from video. By comparison, 2017 saw 598 billion total streams. 2018’s audio-only streams came close to surpassing 2017’s audio and video streams combined. This enormous increase in streaming numbers speaks to the universal arc of streaming in the current climate. It’s extremely common for fans to have a subscription to a music streaming service, something not nearly as prevalent five years ago. In Q4 of 2018, subscription streams accounted for 85% of all on-demand audio streams. This tells us is that most music streamers are listening through their paid subscription, rather than using the free version with advertisements. People are more willing than ever to pay an upfront fee in exchange for an uninterrupted, cleaner listening experience. 2018 also showed us that hip-hop/rap remains the king of the modern day genre race in America. This is the third consecutive year that hip-hop/rap had the largest percentage of total song consumption. 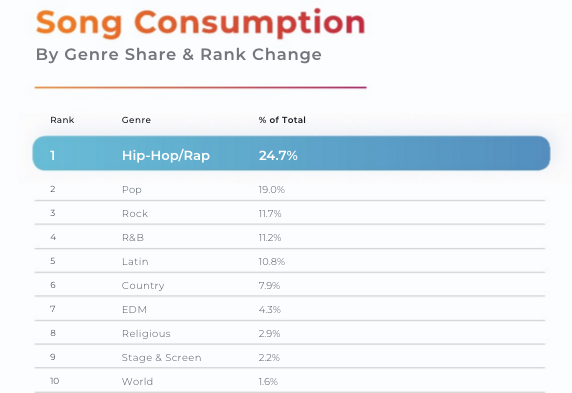 Almost one out of every four songs listened to in 2018 were hip-hop/rap songs (24.7%). While rock and roll dominated much of the 20th Century, hip hop/rap looks poised to control US charts for the foreseeable future. We are witnessing America embrace hip-hop as a legitimate music superpower, a feat unimaginable just 20 years ago. 2018 also showed us that Drake remains the biggest music star on the planet. This shouldn’t come as a surprise, but the accolades are staggering. For the second consecutive year, Drake earned both the album of the year, Scorpion, and the song of the year, ‘God’s Plan,’ which garnered the highest number of both audio and video streams for any track in 2018. Scorpion logged more than 6.2 billion on-demand streams this year, almost two billion more than second place, Post Malone’s Beerbongs & Bentleys. Also, Drake’s song catalog was the most streamed by any artist overall. This past December, Spotify announced that Drake now stands as the most streamed artist in music history. The most encouraging takeaway from the 2018 report is that people are listening to more music than ever, and further, they’re choosing to pay for it, an uplifting sign for the industry. Total music consumption increased by 16.2% from 2017 to 2018, an upward trend. From 2016-2017, total music consumption increased by 12.8%. Americans have embraced music streaming, and it seems that most listeners do not expect that music should be free. In the days of Napster, Limewire, and YouTube ripoffs, the industry and consumers stood at odds over the expectation of paying for music. With 85% of all streams coming from paid subscriptions, it seems most people are willing to pay a fee for access to hundreds of millions of songs. As access to global music increases, fans are also listening to a wider variety of artists. In 2018, people listened to three million more unique songs than in 2017. This means that more artists are reaching new fans and that listeners are more willing to traverse new territory. “Consumers are exercising their choice to explore new music, which is a terrific sign for the industry” said BuzzAngle CEO Jim Lidestri in the report. 2018 was a fantastic year for the music industry. More artists are being heard, more songs are being explored, and more people are paying for streaming access. As the tide continues to shift from sales toward paid streaming, records will continue to break. 2019 may be the first year with over a trillion streams. The music industry is changing in multiple aspects, but people across the world are enjoying more music than ever before. Keep listening to your favorite artists, continue to find new ones, pay to support them, and make 2019 the best year in music yet.